As far back as I can remember I have loved to shop. 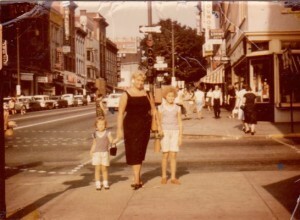 It all began sometime in the early 50’s, Mom would take me and then me and my sister Rhonda downtown every Friday night. 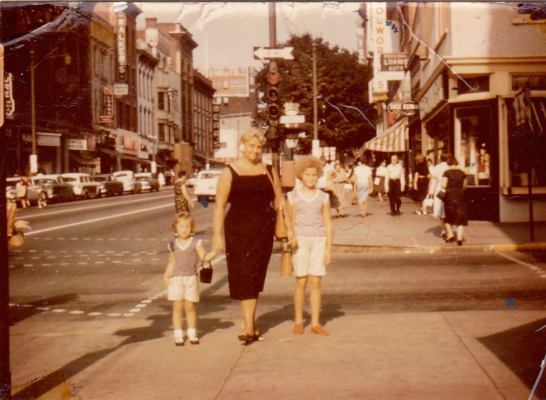 We would go to the Bon Ton Tea Room for dinner and “shop till we dropped”. Then happy and fulfilled and loaded down with shopping bags, we would head home on the bus. Thus began my love of shopping. It still continues, this obsession with shopping. It is my therapy. My thing. Everyone has something, I have shopping. I absolutely love it. I know there are a lot of people who hate shopping, but I’m sure they have something like it in their lives. I have friends these days that get a box full of items sent to them with tops, bottoms and accessories all in the box. Bam! Everything you could possibly need in one box. But what’s the fun in that? Half the fun is in the find! You can quote me on that one. I usually go with someone, a friend or my daughter. It’s more fun with someone, it’s a social thing. And you have someone that can either talk you out of or into buying something, We got this love of shopping from Mom, it’s her fault we spend. She didn’t drink, smoke or play cards or anything that women from her day did, she shopped. And she loved it. She passed that love onto me, my sister Rhonda, my nieces and my daughters and now even my grand daughter. My youngest daughter isn’t as obsessed as the oldest and myself, but she does have her moments. They just aren’t as frequent as ours. The same doctors or whatever they were, went on to say that shopping can be addictive. (duh) And they saw spikes in dopamine activity in the group they were testing. It is especially so when it comes to bargain hunters and events like Black Friday sales. So at least I have a reason and a good one at that, for my love of shopping. It is somewhat comforting to know I have a clinical affliction and therefore can’t help myself from buying that new purse. It isn’t just women who love to shop, while they are probably the ones that do it the most, there are a lot of men who love to shop too. They just shop for different things…cars, tools, car parts and many kinds of collectable items, like old baseball cards. My son loves tools and would buy them every day if his wife would let him. Seriously..tools? I also read that successful people wear the same thing every day. Einstein wore grey suits. Steve Jobs wore a black turtleneck. And Mark Zuckerberg wears a tee shirt and jeans every single day. Notice there were no women on this list, I guess it must be a “man thing.” They really have no need to shop and can easily pick items from their closets each morning without stressing about “what to wear.” Again, what’s the fun in that? And so I’m simplifying and decluttering and not buying as much(well not quite as much). The getting rid of things part is a whole other thing and hard. How do I get rid of that leather jacket I wore to the Aerosmith concert? But, I’ll tell you one thing, I will not give up shopping. You will see me, a little old lady on my scooter, scooting around Walmart, shopping till I drop. On second thought….no, I just can’t do Walmart, no matter how old I am. It will have to be TJMaxx. Ok, I’ll admit it… my name is Renee and I’m a “Shopaholic”….